OK, it’s the first week of December, how many of you are still Christmas shopping? Do you have all of it left to do? Do you just have those hard to buy for people left on the list? Just a few little things left to pick up? As I try to buy for all the people in my life, I have been putting together some gift guides to try to help you all out! It can be stressful trying to make those lists, find the time to shop, wrap and deliver. A few weeks ago I talked about tween girls and you can find that one here. Last week I talked about 6-8 year old boys, here. Today I put together a few lists of some gifts that would be great for a girlfriend, sister, teachers, grandparents and the men in your life! 1. Ballerina Slippers - I am bare feet a lot in the house, but when it starts to get chilly, I love some cozy slippers on my feet! These are adorable and look like they would be super comfortable for a chilly night in the house! 2. Simplified Life by Emily Ley - I think everyone needs to read this book. Who isn't looking to simplify their life these days? I really don't think I talk to anyone that doesn't feel overworked, overwhelmed, stressed and too busy. I think it is time for a change and this book will help! I am currently working through the book and I have a few people on my list that are going to get it from me! The gift certainly doesn't need this specific book, but I think a meaningful book is always a great gift! 3. 12 Pack of Paper Facial Masks - We love to do face masks in this house! We have some go to's, but I also love to experiment. I have bought a few of these paper masks and they are quick, easy and less mess! Who wouldn't love to relax with a face mask, and you wouldn't always spend the money to get yourself a big pack like this to try! 4. Gift Candles - OK, I love me some candles! I love to have my house smelling nice, but there is just something about settling down for the night, turning off all the lights and watching TV with just a candle or two burning. I think that is why I love Christmas twinkle lights so hmuch, I just love dim lighting at night! You could also enjoy a couple of candles in the bathroom while you take a bath! This candle that I found was just so pretty and you could reuse the tin after you finish the candle, it's like two presents in one! 5. Aromatherapy Collection Muscle Soak Bubble Bath - Do you know someone who loves to take a bath? If you do, they can never have enough bubble bath! Since we have installed our new soaking tub, I am going to through bubble bath quite quickly! This muscle soak bath sounds amazing! 6. Genteele Super Soft Luxurious Sherpa Throw Blanket - The name says it all. Super soft, luxurious...need I say more? I just personally don't feel that you can ever have enough soft blankets in your home. I am all about being cozy, so I need blankets in the living room, my bedroom, basically anywhere this is somewhere to sit! I need large blankets for snuggling and smaller personal size blankets for when I want to cozy up alone! I need extra warm blanket and lighter but still cozy blankets. You know what I mean?? This one looks great to me! Grab the blanket and add the slippers for someone who is always cold on your list, or add the book instead for someone you know could use some time to cuddle up and read a book or just the blanket and the candle! For your child's teacher, they work so hard with our kids, how about the Candle, bubble bath and Face masks. A relaxing night in provided by you! You could mix and match all day and check off all the ladies on your list! 1. Under Armour tech long sleeve t-shirts - It's that time of year where we are going from short sleeve to long sleeve shirts and these Under Armour shirts are my hubbies favorites, so I had to add them to the list! 2. Beard Care Kit by Mountaineer - There are a lot of beards out there! I'm not going to lie, I am a beard girl. I love Mike with a beard! He really has never done anything special with his beard, so I think this would be a fun surprise. 3. Breakfast Sandwich Maker - Ha! Every guy wants a small appliance, right? Well, if you have a guy that loves a breakfast sandwich, he just might think this is awesome! There is actually a cookbook that goes along with it, here. I haven't made up my mind on this yet, because I do feel like Mike will first say, "seriously, another small appliance?" but the reviews on this have me a bit sucked in! I feel like this would help us out in the morning! He often skips breakfast because he just drinks coffee and doesn't have the time to make something...this could solve this problem for him! 4. Wool Socks - Mike gets cold pretty easily so he loves him some wool socks! If you have a guy that gets cold, or that is outside a lot in the winter, a new set of wool socks is always a great gift! 5. Fitbit Alta HR - Mike started using this a few months ago and it has seriously motivated him! If you have a guy that may need a little motivation in the moving department, this would be the perfect gift. Mike sits at a desk all day and this has made him take all his conference calls walking around. He hits 10,000 steps so easily now! A few years ago, I gave this book to one set of the grandparents. Memories for My Grandchildren. 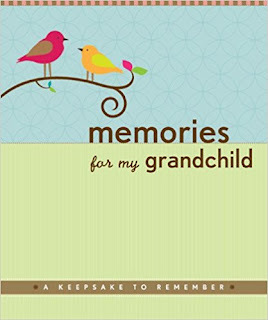 It is a book for the grandparents to document about their lives and it will be gifted back to our children someday! Someday they will get to learn so much more about their grandmother and grandfather by reading these books! And, I gave them each the book with a super soft blanket so they could get cozy and write in the book! See, I have been giving soft blankets for a long time!! I also found a few alcohol related gifts that would be perfect for a yankee swap gift! The first is a wine "glass" that I gave at a swap with a bottle of wine a couple of years ago! Mine said something a little different, but same idea! If you click here, they have a few different sayings available! Then for the beer lovers, there are these cool 6 packs that you add your own beer to, but the outside is decorated and includes a card right on it! Love these! Last thing, if you are local and you have someone that is hard to buy for, I am offering some gift certificate specials over at Beautifully Organized! Know someone who could use some organizing or a redesign of a room? Come check out my Facebook to see what I am offering! This post contains affiliate links, meaning if you click a link and make a purchase, I get a small percentage of the profit. This does not effect your cost, but does help support my blog! Thank you!